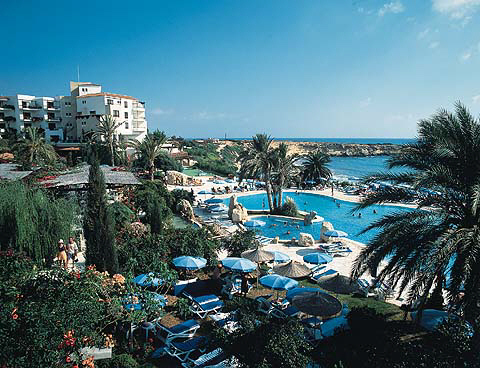 The Coral Beach is a superb resort hotel, in an idyllic beachfront setting with 500 metres of natural sand, embraced by the clear turquoise waters of the Mediterranean. 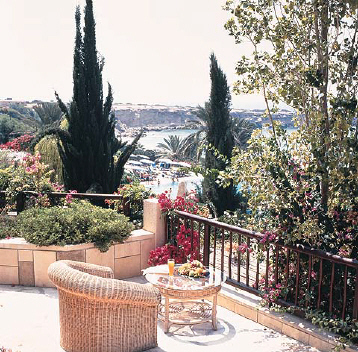 Bordering the Akamas Peninsula, an area of outstanding natural beauty, The Coral Beach is renowned for its unique design, reflecting the local character and respecting the island’s environment. 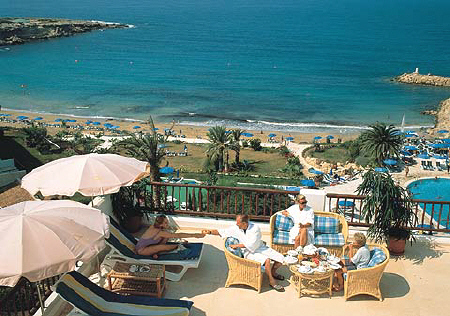 Built traditionally with local materials, the hotel offers undisturbed views over the lush landscaped gardens and the beach. The unforgettable high standards of service and cuisine offered in the numerous restaurants, bars, and the other extensive five star facilities, will ensure holiday memories of a lifetime. 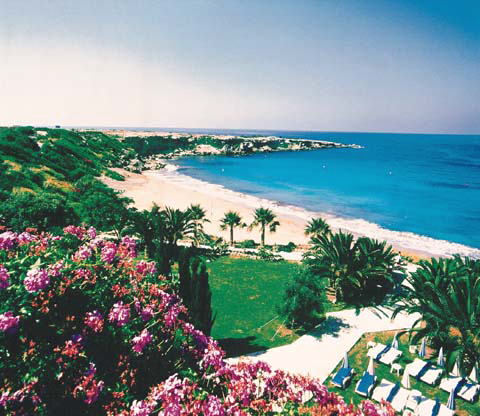 At this luxurious yet casual resort, you can revitalize your mind and body in the calming environment of the health spa, learn some of the island’s ancient crafts in the art & crafts centre, enjoy a wealth of sports and water sports and, in the Paphos area, two 18 hole golf courses. Here your vacation may be as active, as relaxed or as pampered as you desire. 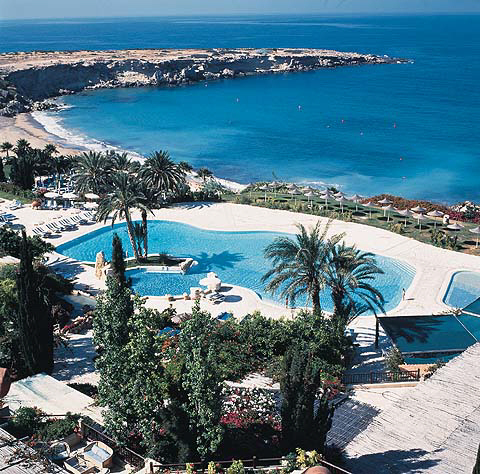 The hotel is a 10-minute stroll from the village of Coral Bay, and a short drive from the picturesque town of Paphos with its world famous archaeological remains. 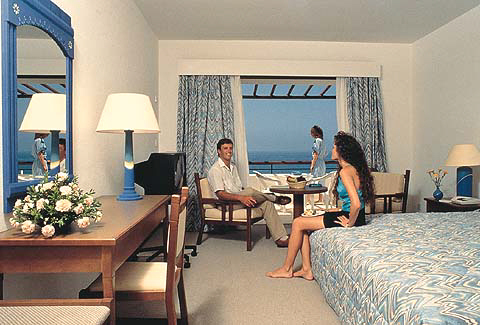 The hotel provides an unrivaled choice of accommodation – the innovative rooms of the hotel or the luxury of the Coral Suites. At the Coral Beach Hotel & Resort there awaits an unforgettable array of dining experiences inspired by the world's great culinary capitals. 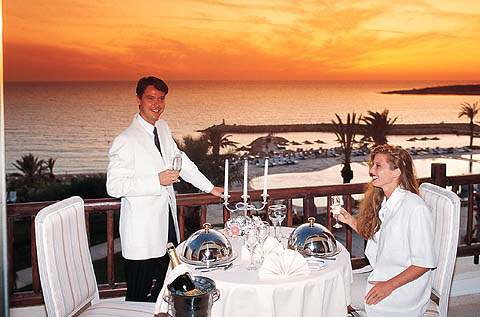 There are six restaurants offering a selection of cuisines from Cypriot to French and from traditional fresh fish to romantic Italian. On those warm Paphos evenings, we propose a taste of the Cyprus Night with some delicious local dishes and wine from the Paphos vineyards, accompanied by traditional folk dancing at the Limani Taverna by the fishing harbour. 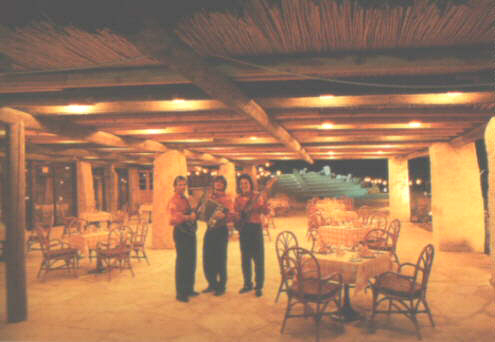 All restaurants adjoin terraces, so breakfast, lunch and dinner can be taken outside. For our younger guests early meals are available. Pamper yourself with rejuvenating spa treatments at the Health & Beauty Spa and get spoiled with life’s small pleasures. Aromatherapy, hydrotherapy, personal training and mind body programs will revitalize your mind, enhance your well-being and nourish your body. For sport lovers, there is a great variety of sports available. There are four floodlit tennis courts (two hard and two soft courts), a gym, an indoor swimming pool, a squash court, mini-golf, snooker, pool and games room. Playtime is an essential part of your children's daily routine. 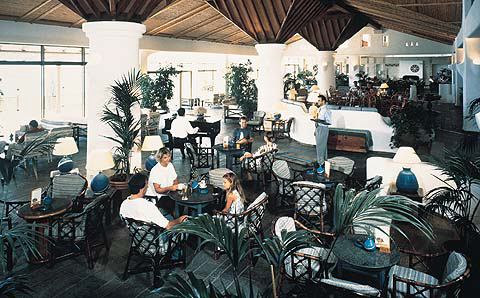 Therefore, for your comfort and their treasure we have a well organised, supervised Club on the resort grounds. Here our younger guests can enjoy a full day of interactive and creative games, movies, to suit all ages and interests. 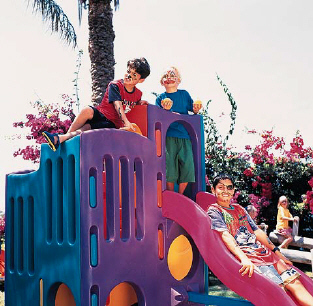 The Children's club accepts guests of 4 years to 12 years of age. Younger children are welcome if accompanied by a parent or guardian. En-suite bathrooms (tub and shower), Individually controlled Air conditioning, Safe, Mini-bar, Radio and music channels, Shaver socket 110/220v AC50cps, In-house movies, Full length mirrors, Satellite television, Smoke detector ,Message waiting system, Hairdryer, Direct dial telephone, Balcony / terrace. Executive suites have whirlpool spa baths. 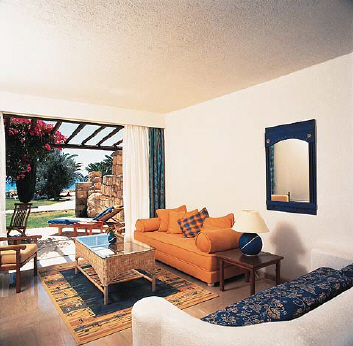 Also available: - Interconnecting rooms, Rooms for disabled guests. 800 metres to a few bars, restaurants and shops. Taxis can be pre-paid and booked or taken directly from the airport as they are readily available. Cruise to nearby Countries on 2 or 3 days cruises. Disclaimer: The details above are believed to be accurate at the date of publication, however no guarantee is provided by the booking agent for outdated or incorrect information. We reserve the right to change displayed prices at any time without notice. Please Note: These hotel rates are set by the www.cyprus-hotels.com web site and are only valid for clients booking through this web site subject to availability. They may not be honoured if you book directly with the hotel or any other services. Thank you for using our web site ! Copyright © 1997 -2019 Armata Productions. All rights reserved.